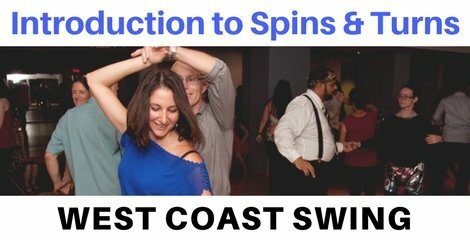 West Coast Swing Spins and Turns are an important element of mastering the dance. Spins are used in almost every form of dance, and WCS is no exception. The ability to turn smoothly and efficiently is one of the major differences between raw beginners and experienced dancers. Whether you are a follower or a leader, mastering the techniques that go into spins will make a huge difference in your dancing. Pivot turns keep your feet in a straight line as you pivot around the weighted foot and then transfer your weight to the free foot before continuing. These are usually used for half rotations. Learning this skill is an important step in improving your west coast swing spins and turns. Followers use a pivot turn to create a sharp rotation after beat 2 of a whip. Leaders use pivots on a side pass after 2 if they want to flip to the other end of the slot quickly. Pivots are also the foundation of the pivot whip, which involves both partners doing pivots together, down the line, after count 4 of a whip. Couple pivots like this are one of the hardest moves in every style of partner dancing! Chaine turns involve closing the feet together to rotate before taking another step. Unlike pivots, chaines can be performed quite rapidly because of the closing action. They are the spin of choice for most situations involving multiple spins, such as spinning down line in a barrel roll or doing a whip with a double outside spin. Followers use chaines all the time; for leaders, advanced patterns that combine scrolling or traveling with spinning usually involve chaines. Pirouettes are one-footed spins. They appear in the iconic WCS move, the pot-stir, as well as stationary spins such as spins on the anchor (for both followers and leaders). Sometimes it is even possible to turn extremely tight chaines turns into a pirouette! Check out this video for a great tip to improve all of your spins. There are some elements of WCS that can be learned away from the dance floor. Try practicing musicality and pattern structure. Not spins. Spins require a lot of floor time to master. Although there are no shortcuts to becoming a great spinner, you can speed up your progress by applying the principles of deliberate practice. An hour a week of focused drills will improve your spins much faster than hours of unfocused social dancing. We have great resources in our video library. You can become a member and access everything here! Or head over to our store and pick up a copy of THE ULTIMATE GUIDE TO SPINS AND TURNS! Ok ok if you really don’t want to spend any money, sigh… you can get some free tips one one foot spins below!